POWER GRID, North Eastern Regional Transmission System requires eligible experienced personnel for Consultancy Projects in North Eastern Region including North Eastern Region Power System Improvement Project (NERPSIP) in the states of NER and Comprehensive Transmission & Distribution (T&D) Scheme in the state of Arunachal Pradesh. Power Grid Corporation of India Limited will conduct the screening test & personal interview. Screening test will have 75 questions in two parts- 50 pertaining to relevant discipline and 25 pertaining to aptitude. Those candidates who will be qualified in the screening test they will be shortlisted for the interview. The final merit list will be made on the basis of performance in the interview. Screening test will be conducted very soon. 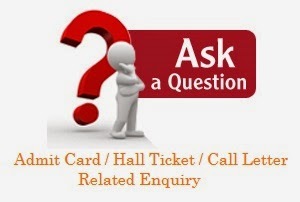 Candidates who are searching for their PGCIL Field Engineer Hall Ticket 2015, they need to wait up to 10 March 2015. On this date PGCIL will be announced the next announcement. All the candidates must have their own call letter at the time of examination.